One of the many fun parts of designing your own website is playing around with different styles, themes, fonts, colors, images... the possibles are almost endless! When you switch between themes your edits will only be saved within the theme you are working in. For example: if you change the font color scheme in Ballard, when you switch to Marquee the color scheme won't switch over; but when you switch back to Ballard everything will be the same as when you last worked within the theme. 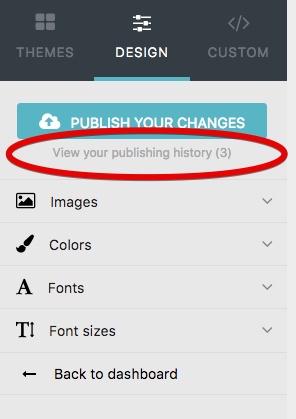 Another easy way to switch between edits is by clicking "Publishing History". Here you can see all the edits you've made, and can restore to previous versions to save time and effort. * Remember to always click "Publish Your Changes" after making a, or a series, of edits.